We first met at an auction, in October 1999, that my dad and I were at, looking for a replacement pony. My dad lost his mare and mother to his only other pony in September 1999 and he wanted to find a match. While sitting at the auction my farrier and friend Jackie came in and told me of a haflinger that was outside and going to go thru the auction. I always wanted a haflinger and went out to see her. She was being ridden and it was love at first sight! I came back in and tried to convince my dad to bid on her. She looked just like his lost mare only bigger. At the time my farm only had 2 mini horses and I was struggling with the decision of getting some haflingers so we could ride. I knew it would be a big expense. We would need bigger shelters and all the riding equipment. When she entered the auction ring my dad said no, that she was too big. She didn’t sell at the auction – no one would bid the minimum. We left the auction horseless, but I couldn’t stop thinking of how much I wanted her. I had already decided that my first haflinger would be named Honey, and some day I was going to have her. 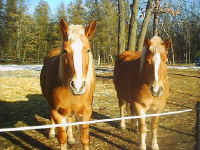 Then in February I got a call from a friend that a boarding and training stable in town had a haflinger for sale. I immediately went over to see. I drove onto the property and saw the haflinger out in the field. The horse came to the fence and our eyes and breath met. The caretaker of the farm told me she was for sale and I left a message for the owner that I was interested. I asked what her name was and she told me HONEY! I knew that horse was going to be mine! I bought Honey with 3 months boarding so I could get things ready for her at our farm. We ordered a big run in shelter that would be delivered in April. Every day I went to spend time with my new horse and when the weather was good even brought her home for visits while I waited for our shelter to come. Now I needed to find another haflinger for my husband to ride. In March the stable owner I bought Honey from told me of another haflinger was for sale from the same man she bought Honey from. I got all the details and arranged to go see him. The farm he was at was near the auction I was at back in October. I discovered that honey was the same horse that was at that auction and didn’t sell!!!! This news was truly a miracle of how we were meant to be together! ‘Brandy’ was exactly the other haflinger I wanted and I bought him. The shelter was delivered early and within a week both of our miracle haflingers were home for good! Since then we have all our riding equipment and driving equipment. Honey learned to drive our cart and sleigh with her training us more than we had to train her! Brandy, too, is willing to do anything we ask! Honey is truly the lead mare of our now herd of 10. She is all that a lead mare is – confident, forgiving, brave, honest, trustworthy and a safe place to be for all of us! I thank God every day that I had the courage to follow my dreams!!!!!! This story tells of the beginning miracles that all brought us to where we are today. These horses continue to teach us what compassion, respect, responsibility and love truly are. It is an ongoing process. No human was born knowing all that we need to know. Our views of animals have evolved…..day by day, by living with them. Thru their unconditional love, patience and forgiveness we learn how to be like them. Thru the miracles that brought them to our farm we have hope and faith that we are doing all that we were meant to do. Our farm, Miracle Acres, is a forever home for all our farm family. They will never be used for profit or entertainment. We play with all our animals – natural games – that they enjoy as much as we do. We communicate with each other and strive to teach others how to do the same.